Joyce is pleased to introduce some exciting new names which originate from all corners of the globe. Foremost, Joyce would like to announce a new crop of young women’s wear designers, who are emerging from the Paris fashion scene. They celebrate modern femininity through sculptural silhouettes, diverse materials and precise tailoring – all with a dose of fierce attitude. The 29 year-old Dutch designer graduated from the fashion design department of Artez Institute of the Arts Arnhem. Other notable graduates include Viktor and Rolf amongst others. Van Herpen interned at Alexander McQueen, London before launching her own label in 2007. Since July 2011, van Herpen has been a guest member of the prestigious Parisian Chambre Syndicale de la Haute Couture, which is part of the Fédération française de la couture. Her signature organic cage designs from the haute couture collections have been adapted into glossy leather dresses, shimmering pleated skirts and razor sharp jackets in the Spring Summer 2014 ready-to-wear collection. Léa Peckre Spring Summer 2014 collection draws its inspiration from the wind, the cliffs and the ghosts of her childhood. She continues her structured and architectural style using denim with contrasting fabrics such as wool crepe, mesh and lace. 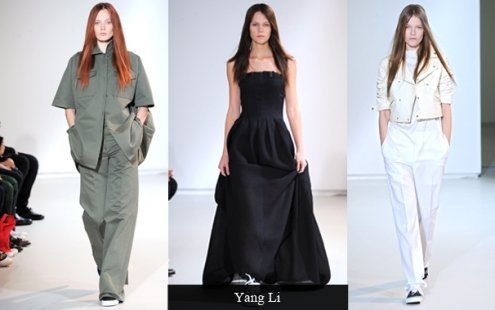 Peplums and gores give volume yet structured draping exudes a feminine fluidity. Peckre was first attracted by artistic studies and developed an interest in construction and design through the working with ceramics and textiles. In 2011, after graduating with high distinction at the prestigious fashion design school La Cambre in Brussels, she won the L’Oreal Professional Jury Grand Prize at the 25th International Hyères Festival. This achievement acted as a catalyst for her fashion career, which landed her design roles in Jean-Paul Gaultier, Givenchy and Isabel Marant. This in turn paved the way to Peckre starting her own label in 2013. Born in Beijing, raised in Australia and educated at Central St. Martins London, Yang Li’s “workwear couture” is taking the fashion world by storm. Khaki and beige linen structured outerwear is paired with frayed silk and wool ensemble. Discolourated alligator leather adds a touch of “rough luxury” to the collection. This is not the cliché “high-low mix,” instead it’s a calculated juxtaposition of 50’s elegance, dark romanticism, and intellectual deconstruction, with a street style influence.